We all know the importance of being comfortable in our own home. No matter the price tag, having everything on hand that we need to feel at home is simply priceless. 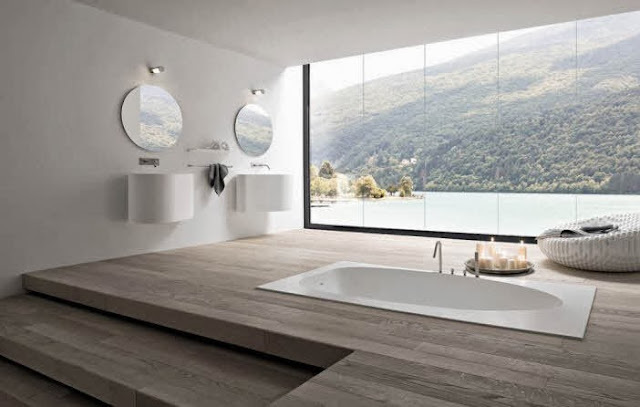 One of the most important rooms in a home has become the bathroom. It is no longer just a room for basic needs, but with a few improvements can become one of the most luxurious rooms in a home. Here are four of the top improvements that can turn your simple bathroom into your favorite room in your home. One of the best parts of the bathroom is those hot morning showers or late night bubble baths. It is a time when we can relax and wind down for the evening, or get prepared for our day. That is until we step out of the tub onto the cold tile floor. One of the most popular and relatively easy upgrades out there for the bathroom is radiant heat flooring. It is a basic upgrade that uses thin heating cables, similar to those in a heated blanket, to heat the entire floor of a room. The price to install radiant heat flooring is about 75 GBP per square meter, and costs about the same as three 100 watt light bulbs to run. Remember the days when having a shower head with five different water pressure settings was a luxury? Well those days are over. Now you can tell your showerhead how warm you want the water, what music you want and how loud, and what kind of massage you'd like before you step in. Programmable shower heads let you set your personal settings and all you have to do each time you step into the shower is push a button. Some of the fancier models even have Wi-Fi. Who knew? These luxurious shower heads can run anywhere between 215 GBP to 2500 GBP, depending on your personal preferences. We've all seen those movies where there is a television in the bathroom, right? We all dreamed of having one ourselves. The only problem was the people that had them in the movies were usually millionaires. While still a little pricey, the dream of having a television in your bathroom is no longer out of reach. Prices range from 1500 GBP to 2500 GBP, depending on the model you choose. And if you have a small bathroom, don't worry; some newer models have been integrated into the medicine cabinets for space-saving! Who needs a magazine rack next to the toilet when you can plug your smartphone or MP3 player directly into it? One of the newest trends for the bathroom is the high-tech toilets. Not only can you plug your smartphone and MP3 players into them, but they are also equipped with top of the line speakers for your entertainment. Being one of the newest upgrades for the bathroom, it is also one of the priciest at the moment, ranging anywhere from 2800 GBP to 4500 GBP. Prices should drop as more and more brands of these products come on the market, so keep your eyes open for more affordable versions. With so many new upgrades to suit your lifestyle, upgrading your bathroom no longer just means re-wallpapering the walls and changing out the tile. Your bathroom can now become your favorite room in your home with just a few simple improvements. All you need to do is figure out which one best suits you. Jim works and writes for JT Spas, an independent retailer based in the UK and Ireland, supplying discounted bathroom furniture.